G-TEC is proud to introduce the superior AP 128 UPS, 19" Rack Mounted type and Modular UPS, which can be configured in N+X for the most demanding application. They are both designed to deliver clean, safe and regulated power supply to protect your critical mission equipment, so as to safeguard your valuable equipment and critical data from any abnormal power disturbances, such as surges, spikes, blackouts and lightning strikes. 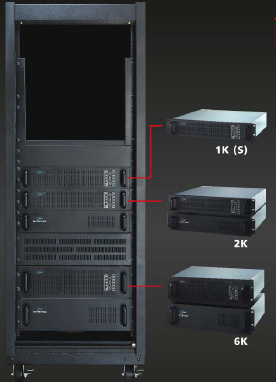 AP128 Rack Mount UPS make use of the unique AC-DC conversioncircuitry to prevent line power failure, power sags, power surges, brownouts, line noise and high voltage spikes; frequency variation,switching transients and line harmonic distortion. With the use of outstanding IGBT as the power conversation component, the operating frequency of the inverter of UPS is capable of reaching tens of KHz, due to the high frequency operating characteristics of IGBT. Higher working efficiency of the inverter also improves the overall efficiency of UPS. Also, high switching frequency reduces UPS noise as well. 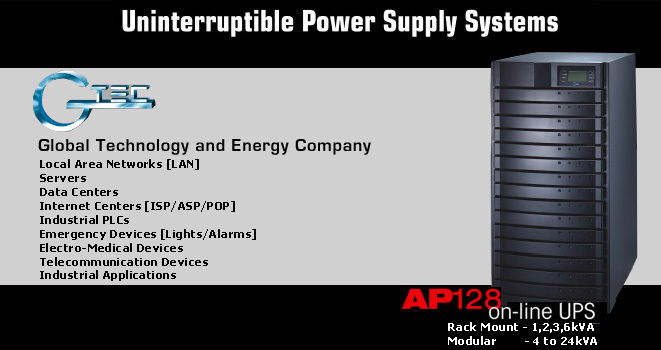 AP128 Modular UPS is a scalable single phase & three-phase with double-conversion uninterruptible power supply which is specially designed to meet the demands of corporation. It can be configured to parallel redundancy which provides the maximum reliability and delivers power output per modules from 4kVA to 24kVA. 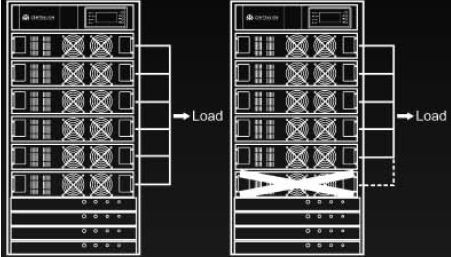 capacity for longer run-times or to add N+X parallel redundancy as well. That gives our customers increased flexibility and reliability to maximum the power, and is very cost-effective to upgrade the system without a large investment. 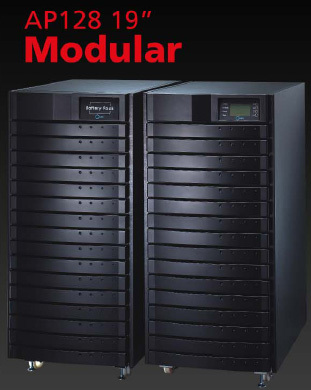 Modular design for 6 modules redundancy is a key flexibility and an ideal way to provide the highest quality online power protection for mission critical installations from 4kVA to 24kVA. The modules can be hot-swapped and enabled true continuity of power to the load without any interruption of service. It also designs for 19” rack mount. 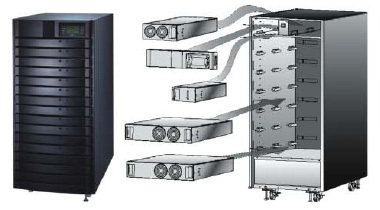 Parallel redundancy feature among UPS has been used as a way of delivering higher levels of reliability and load sharing. If one UPS power module goes faulty for any reason, there are other power modules to assume the load. added an unlimited battery packs allowing a seamless growth path as needs change. 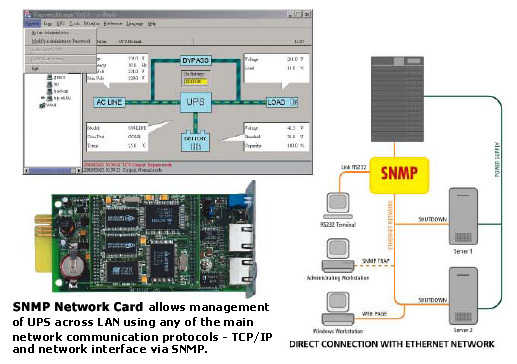 This approach is cost-effective and essential for mission critical applications, or in demanding environment. A fast repair on site is guaranteed through the use of state-of the-art UPS technology and the professionalism of the UPService personnel and Authorized Assistance Centers. UPService guarantees that failed parts are replaced with original ones, tested and updated in order to maintain the safety, reliability and operating characteristics of the UPS. UPService can provide assistance during commissioning and start-up of the UPS equipment on-site with additional training during handover to site personnel. UPService engineers can also verify site suitability, analyse and advice on potential problems, and disconnect and relocate equipment. UPService recommend that all hardwired installations are commissioned by UPService engineers. MAINTENANCE CONTRACTS can be provided by UPService to minimize response times periodic inspections to comprehensive cover including labour and materials. The TELEGUARD software package provides remote 24 x 7 UPS supervision. TeleGuard can interrogate G-TEC UPS connected to a local telephone line to check on their operating logs and systems status. Should the UPS report an alarm condition, the UPService Call Center is immediately notified and a dedicated customer response activated. Routine site reports can be sent automatically to customer personnel. UPService organizes regular TECHNICAL TRAINING COURSES for UPS operators and installers. WinPower CD is packed with UPS, and can also be downloaded from the internet. It has the function of remote monitor and control UPS through LAN, warning notifications through broadcast and mobile phone, multi-shutdown PCs, and schedule UPS self-test. This unique software provides complete power protection for computer system during power failure. The software supports lots of O/S including Windows family, Linux, Sun Solaris 7/8/9, Compaq True64, FreeBSD, IBM Aix 4.3x, 5.1x and HP-UX 11.x. More than that, to offer increased benefits for our customers, we have also released USB version MAC version on the Internet. Multi-OS supported: Windows Family, Linux, Sun Solaris 7/8/9, Compaq True64, FreeBSD, IBM Aix 4.3x, 5.1x and HP-UX 11.x. * All the trademarks indicated are the property of their respective owners.